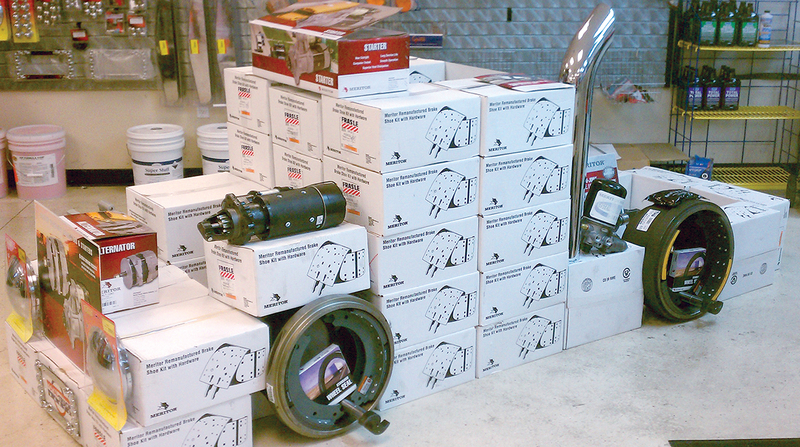 A growing economy and strong new truck sales have increased demand for aftermarket parts, creating supply chal­lenges. Truck manufacturers and component ­suppliers said they’re working to alleviate pressure on the industry by expanding offerings, ­improving distribution channels and using predictive forecasting tools to get ahead of demand. “With the economy running on all cylinders, it is clear that everybody who manufactures and builds is impacted by the situation,” said Stefan Kurschner, senior vice president of aftermarket at Daimler Trucks North America, which builds Freightliner and Western Star trucks and Detroit engines and components. Capacity issues sometimes can impact the company’s parts availability, he said. Kurschner said it’s difficult to pinpoint specific parts that have been in short supply. “When it snows, we have a peak for certain parts,” he said, noting that when it’s warmer, other parts are in demand. For Dan Carrano, director of fleet maintenance for A. Duie Pyle, finding parts has been one of the fleet’s bigger headaches. “When you think of a new truck, you don’t think you’re going to need parts, but mishaps ­occur,” he said, adding that deer strikes are common in some areas during the winter. The fleet recently had to wait months to get a hood and ended up importing one from a plant in Mexico, Carrano said. A. Duie Pyle, based in West Chester, Pa., ranks No. 79 on the Transport Topics Top 100 list of the largest for-hire carriers in North America. Doug Dole, general manager of product strategy at Meritor, agreed that the economy and new production have resulted in more demand for parts from the supplier. “New truck manufacturing and our production volumes are nearing record highs,” he said. However, “this puts a strain on the entire system,” Dole said, adding that Meritor has bolstered its online parts ordering website, expanded its distribution and instituted specialized 24-hour delivery programs. “We need to have the right product breadth and ensure we have the right parts and distribution footprint to meet customer needs,” Dole said. Tim Bauer, vice president of aftermarket for Eaton’s vehicle group, said there have been some “small delays” in manufacturing, and that Eaton has seen increased demand due to situations in which components, such as clutches and transmissions, are replaced. Glen McDonald, director of maintenance for Memphis, Tenn.-based Ozark Motor Lines, said he has heard more about part shortages than he has seen. But, he sometimes has had a hard time getting body panels. “Sometimes you have to wait to get the body parts and specialty pieces,” he said. Equipment also has become increasingly complex, which is adding to the demand for truck parts, industry experts said. North Canton, Ohio-based Kenan Advantage Group ranks No. 24 on TT’s Top 100 list of for-hire carriers. Altrichter said he has seen some parts issues “here and there,” and is stocking items with significant lead times in central locations. At Ozark Motor Lines, five of the top 25 parts purchases are emissions related. “Ten years ago, you wouldn’t have seen that,” McDonald said, adding that the carrier also is stocking more of these emissions systems-related products than in the past. At the same time, though, the driver shortage has alleviated some of the pressure on the maintenance shop, McDonald said. “The advantage of the driver shortage to the shop is that there is a truck or two sitting around that the driver can use while we work on the truck for a couple of days. If there were no ­driver shortage, we would really be pressed,” he said. A. Duie Pyle is starting to stock more of the parts it finds difficult to come by, such as exhaust and aftertreatment system-related items, to help minimize downtime. Carriers also said they’re expanding their reach to find the parts they need. In November, McDonald’s usual dealership was out of the filters that Ozark Motor Lines buys. The carrier was able to go to an outlying shop in Springfield, Mo. “We got enough to supply us and those in our network that were needing them,” McDonald said. He said he prefers to buy proprietary parts from the dealership, but he has gotten creative with some sourcing. McDonald found a battery disconnect for the fleet’s auxiliary power units at a marine wholesaler. “I’ll buy from a boat wholesaler for half of what I can get it with a brand name on it,” McDonald said. He also started looking for a better price on the wire the company uses to install APUs. “I went online and shopped around and found where I could buy the wire pre-cut to the length we need and could save 60% and get free shipping,” he said. Carrano also prefers to go with OEM parts and is willing to look at dealers outside of his immediate network. Truck and component manufacturers said they are focusing on distribution to ensure parts are in the right place at the right time. “There is a pretty intense game of logistics that has to happen,” DTNA’s Kurschner said. DTNA plans to open a new parts distribution center in Phoenix in the second quarter, which will allow the OEM to get parts to 90% of its service locations within 12 hours or fewer. In 2018, Daimler added distribution centers outside of Des Moines, Iowa, and Indianapolis. Truck maker Navistar has two distribution centers slated to open in 2019. It used to be reasonable for a ­weekly stock order to the company’s distribution centers, “then it moved to multiple times a week, now it is overnight delivery with parts arriving during the night’s hours,” said Josef Kory, senior vice president of parts at the manufacturer. Navistar also is encouraging dealers to open Fleetrite stores. Navistar has tried to be more predictive in its forecasting and uses telematics to identify fault codes and associated parts to be used. The OEM also has certain systems to manage its inventories and dealer inventories, Kory said, adding that it also invested in expedited shipping. “We’ve been able to maintain 98% fill rates pretty consistently and that is with some supplier constraints on capacity the whole industry has seen,” he said. Michael Lynch, director of supply chain operations for Navistar, added that the company also looks at historical demand. “We really are trying to get smarter and smarter about how we do this,” he said. Connected trucks, DTNA’s Kurschner said, will help improve forecasting and improve service events by predicting certain failures. “With better data available, diagnostic models are improving,” he said, noting that parts availability also will improve as a result. Eaton reviews emergency orders from fleets quarterly and flags repetitive orders so the company can uncover what is driving demand and find a solution. “Then we aren’t chasing the demand,” Bauer said. Eaton also has used expedited shipping but is looking at ways to manage demand. “We look at alternatives where we may have product available. Maybe it is an upgrade to a higher torque that we may have in stock,” Bauer said, adding there are times when needed components are already bundled into service kits. The strong freight market has resulted in lots of tractors, trucks and trailers that need regular maintenance to keep moving, said Jerry Conroy, North American regional vice president for after­market sales at Bendix Commercial Vehicle Systems. That demand has created an unprecedented strain on the entire supply and manufacturing chains, he said. Manufacturers, meanwhile, are looking to boost parts production. Daimler plans to expand its parts business and add parts to its portfolio, which Kurschner said will help the company improve customer experiences and turn around service events in 24 hours or less. Osvaldo Gallegos, senior director of commercial vehicle and aftermarket strategy and product planning for Dana Inc., said that Dana recently launched its Spicer Select all-makes drivetrain portfolio for the North American commercial vehicle aftermarket. It is ideally suited for ­aging vehicles, Gallegos said. Navistar has ambitious plans to grow its parts business, Kory said. “We believe that there will be growth in the aftermarket industry,” he said, noting they think that growth likely will come from engine and after­treatment parts. Lynch said Navistar is trying to reach out to second and third truck owners. The company is looking to maximize the tail end of the life cycles on those trucks, he said.